As history has proven time and time again, it’s hard to overthrow a king. GoPro has essentially been the undisputed champ of action cameras ever since founder Nick Woodman began slinging shell necklaces from Indonesia on the California coast to help finance his vision for better surfing videos. Although such dominance in the field has never stopped competitors such as Sony and Polaroid, most people would simply skoff at the idea of HTC entering the camera game with a dedicated device of its own a year ago — after all, the company built its reputation on tablets and smartphones. However, the recently announced HTC Re is looking to take on the market for miniature cameras, with the ability to capture 16-megapixel stills and 1080p video within a waterproof frame that can just as easily moonlight as the Loch Ness monster as it could a smartphone accessory designed for the average consumer with a little cash to burn. The HTC Re may be small and portable with the IPX7 rating to match, but how does it stack up against the similarly priced GoPro Hero3 White? Check out our side-by-side spec comparison below for a closer look at the hardware and capabilities of each mini cam. The HTC Re and GoPro Hero3 may both be extremely lightweight and portable, but they differ greatly in design. The HTC Re is a tubular device that measures less than 4 inches tall, with a periscope-like frame that houses the equipped lens at the tip of the curved end. Only two buttons adorn the device, one on the front for changing filming modes (standard or slo-mo) and one on the top for capturing stills or video using your thumb. The minimalist device also lacks a standard display or interface, allowing you to automatically turn on the device by picking them up. 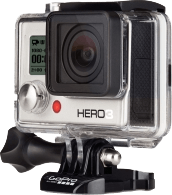 At 2.35 ounces, it’s lighter than the Hero3 – even if you utilize the GoPro without the casing – but it lacks the robust waterproof housing of the boxy Hero3. Whereas GoPro’s offering is good up to 191 feet, HTC recommends you only submerge the Re at depths of 3.1 feet for up to 30 minutes without the company’s optional, waterproof accessory. 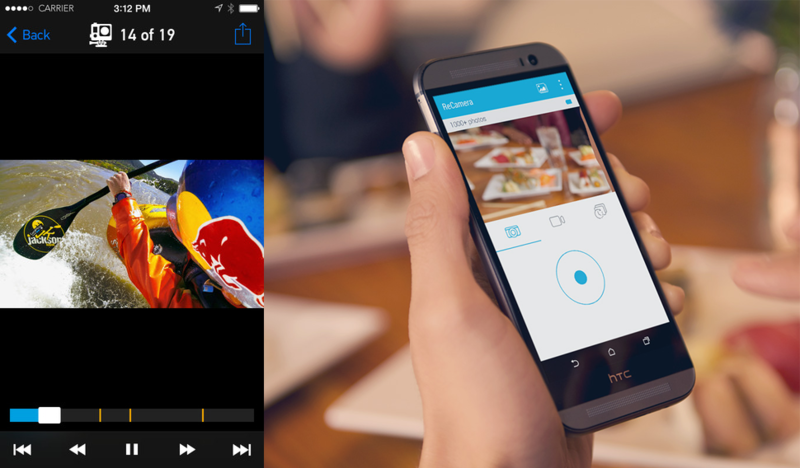 GoPro mobile app (left) and the HTC Re mobile app (right). The Hero3 opts for a more traditional camera design (i.e., boxy). It lacks an integrated viewfinder and interface much like the HTC Re, with a handful of simple buttons positioned on the front and top of the device for turning it on, selecting your desired shooting mode, and recording content. There is a small front LCD, at least, that shows you camera status and you can adjust settings. However, both Hero3 and Re replace the high-resolution LCD displays and viewfinders of yesterday with an accompanying smartphone app for Android and iOS devices, allowing you to view what the cameras are shooting in real-time, or review images and video upon capturing them. Each device also features indicator lights that turn on whenever you start filming, so you’ll be able to quickly tell when the camera is live. Neither camera design is better than the other per se, but it’s hard to argue the waterproof appeal of the Hero3 when used in conjunction with the bundled housing. Design and aesthetics aside, the merits of a quality camera lie within its shooting capabilities. The HTC Re and Hero3 are close in that regard, but the GoPro’s offering adds slightly more shooting functionality to the mix. While both cameras can shoot 1080p video at 30 frames per second (fps) and capture stills, the Re can capture 4x slo-mo video at 720p and 16MP still images. The Hero3, on the other hand, can also capture video at 25 fps whether you opt for 1080p or drop the resolution to 960p or 720p. The latter resolution even expands options that include those for capturing video at 50 fps or 60 fps. Both the HTC Re and Hero3 also tout a similar wide-angle lens with a f/2.8 aperture and provide options for capturing time-lapse video at various capture intervals, though, the Hero3 additionally touts a burst mode for capturing stills where the Re does not. The HTC Re may not claim the most elaborate set of shooting options, yet the device does support expandable storage up to 128GB and comes with an 8GB microSD card. The Hero3 only supports 64GB of storage despite its shooting capacity, but it does boast longer battery life. HTC claims the Re can shoot up to an hour and half of continuous Full HD video, while the Hero3 can capture 1080p video at 30 fps for just over 2 hours. Both offerings also come equipped with built-in Bluetooth and Wi-Fi. Neither the storage, battery capacity, or connectivity will likely make a dramatic difference for the average user, but both worth noting. As far as available accessories go, the HTC Re is no contender with the Hero3. GoPro built an entire ecosystem around its coveted mini cam, with a variety of mounts and accessories suited for any sport you might want to capture (skydiving, snowboarding, biking, etc.). Nonetheless, HTC does offer a select variety of clips, lanyards, mounts, and a few other methods for attaching the Re to various components. The company will certainly expand its lineup of accessories as time goes on, but it can’t currently compete with the sheer number of options afforded by the GoPro and its third-party manufacturers. To be fair, HTC isn’t marketing the Re as a mini cam for capturing extreme sports. It’s designed to be a no-frills device for the casual videographer, one with standard functionality that barely goes above and beyond that of your average smartphone. Although it offers better resolution for still shots than the Hero3 and the opportunity for more storage, it doesn’t quite showcase anywhere near the girth of shooting modes you can get with the GoPro. The Hero3 also touts a bigger battery, a waterproof housing that goes beyond that of the Re, and a treasure trove of accessories for mounting the device to anything you can think of. It simply offers far more for your money than the HTC Re — even if it is the last-gen edition of GoPro’s flagship device.